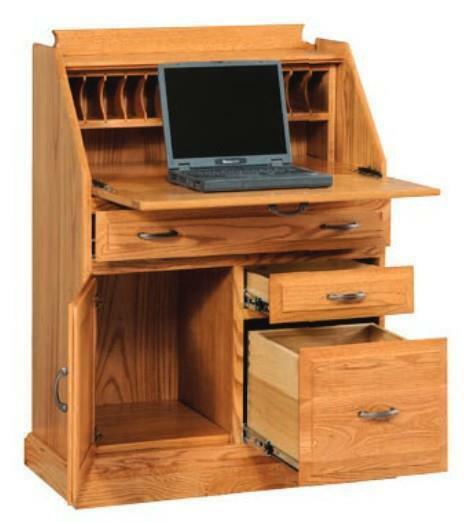 The beauty of a secretary desk is that you can put it in just about any room of your house. If you are limited on space, but need a place to get work done, pay bills, or store important documents & files, well this beautifully handcrafted Classic Secretary Desk is probably the perfect solution for you. The fold down desk top allows you to hide any clutter or important documents by simply closing the top when it's not in use and the row of mail slots inside the desk top offers optimal organization of your paperwork. When closed, this unique desk will fit in with any other furniture in the room. You can even select your wood, finish, & hardware type from a generous list of options so can match your new desk to the existing furniture in the room. In addition to the mail slots in the top, the bottom of this stunning secretary desk includes a file drawer to hang file folders for even more organizational space, plus a large cabinet area on the left and two other miscellaneous storage drawers on full extension drawers slides for any extra office supplies that need a place to be stored. Give us a call today for additional information or custom ordering assistance on this attractive & functional Classic Secretary Desk at 866-272-6773.